Find free classifieds for Houses for sale for sale or to buy in Delhi. FREEADS in India offers you a platform to post free advertisements or classifieds for Houses for sale, Delhi. FREEADS in India helps you search, find, buy, sell, rent or hire in various categories like apartments, goods for sale, local services, cars , jobs and many more in Delhi. Shown below are ads available in Houses for sale, Delhi. You can use search box above to refine your search. ATS Homekraft is a new elegant housing project by ATS Builder situated at Noida Extension. The Premium project ATS Homekraft Nobility provides 2/3 BHK apartments/flats with best amenities. ATS Grand Campus is spread over 17 Acres of the area and marked by green space.. The new residential project Cleo Gold by the name of Cleo County located at Sector 121, Noida. It offers 4 bhk luxury flats which comprises all world top class amenities. Cleo Gold Standard of Luxury Presenting you with the Ultra-Luxury dream home..
Eldeco Live By The Greens, a new residential apartments/flats available for sale in Sector 150 Noida. Get detailed project Information like Floor Plan, Amenities, ... http://www.eldecosector150noida.co.in. Buy ready to move in 2 BHK and 3 BHK flats/apartments in Greater Noida at Paramount Emotions. We offer 2 & 3 BHK residential flats in Greater Noida based on a theme where maximum apartments get the park view and a car parking space. 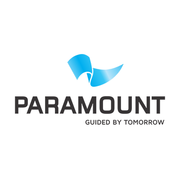 For More Info Visit: https://www.paramountgroup.co.in/emotions-overview. 3 bhk in chattarpur enclave. Delhi Gurgaon Realtors Is An Association Of Dedicated Individuals With Ample Experience In Construction Management And In-House Project Delivery System. Landmark : ASF Insignia Bedrooms : 3BHK Area : 1000 sq ft Metro Station : 10 mins to Rapid Metro 55-56 DMRC : 20 mins to Chattarpur Metro Station, Sulatanpur Metro Station Proposed Metro Station: Gwal Pahari Metro Station Nearest Hospital : 20 mins to Artemis Hospital School: 5 mins to Pathway World School College: 5 mins to Lingya's Lalita Devi College Airport Distance :26. Smart City Project DDA land pooling policy of Delhi Heights, located in L zone provides quality homes at an affordable price. LIG, HIG and MIG apartments in Dwarka, Delhi. For More Info Visit: http://www.delhiheights.com/delhiawasyojna2016.php. Delhi Heights Royal Homes, L Zone. Upcoming 2 bhk, 3 bhk and 4 bhk residential properties in L Zone Dwarka, Delhi. For More Info Visit: http://www.delhiheights.com/royal-homes.php. 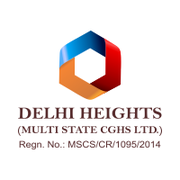 Delhi Heights Multi State CGHS Ltd. is a renowned real estate society of Delhi making upcoming residential projects in Dwarka Expressway. Affordable apartments in LZone Dwarka under MPD 2021 and land pooling policy. For More Info Visit: http://www.delhiheights.com/. Shapoorji Pallonji Joyville Gurgaon - Book your dream home by paying just Rs. 51, 000 (Fully refundable). Buy luxurious, residential projects sector 102 Dwarika Expressway with affordable price, prime location, payment details with PlanMyProperty. For more information visit here -https://www.planmyproperty. Puri Pranayam Faridabad is the best project in Greater Faridabad. Every person wishes to live in a society with the greenery around them. They are accessorized with modern facilities and daily conveniences of the society, club, entertainments units, well re-known health centers, 24/7 security. website:- https://puripranayamfaridabad. Property : The Bungalow. Address : Golf Links, New Delhi - 110003 Plot Size : 1250 Sq.Yards. Built up : GF / FF / SF. Facing : East Facing. Title : Clear Title & Freehold Price : INR 130 Crs..
Book Home in Noida and Celebrate in Dubai. 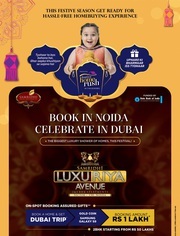 Festive Home Rush brings you this amazing offer at Samridhi Luxuriya Avenue Sector-150 Noida. Class-apart luxury homes with 2 BHK starting from 45.90 Lacs*.Win assured gifts* with on-spot booking-Dubai trip, Samsung Galaxy S9 and gold coin. 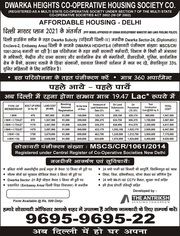 Exclusive Navratra offers for homebuyers. Festive home Russ new launch offer by param homes. There are 2bhk and 3bhk premium residential apartment and commercial project for office space. Very most residential and commercial projects in Noida for festive home Russ offer. There are providing the luxury apartment and best Office space. Our all project at Noida and well located on Delhi to Noida. samridhi Luxuriya avenue project of the samridhi group came up with a new luxury residence in Noida. 2bhk and 3bhk apartments new lunching with the best offer for buyer who area ranging from 1165 sq.ft. To 1690 sq.ft. And best starting price Rs.45.90Lacs*. Location of samridhi Luxuriya connected with Noida-Gr. Samridhi Luxuriya Avenue project of the samridhi group came up with a new luxury residential project in Sec.150.we are offering 2bhk and 3bhk residential apartment which is ranging from 1165 sq.ft.to 1690 sq.ft. and the starting rate from 45.90 Lacs to 66.59 Lacs. It’s the beautiful design by an international architectural, Connected Yamuna Expressway, Noida-Gr. AMENITIES - Club House 3 – Tier Security Badminton Court Jogging Tracks Hi-tech Gymnasium Children’s Park 24×7 Power Backup Rain Water harvesting Exquisite Lifestyle Apartment Swimming Pool along with Kids Pool Basketball Court. Samridhi Luxuriya Avenue project of the samridhi group came up with a new luxury residential project in Sec.150.we are offering 2bhk and 3bhk residential apartment which is ranging from 1165 sq.ft. to 1690 sq.ft. and the starting rate from 45.90 Lacs to 66.59 Lacs. It’s the beautiful design by an international architectural, Connected Yamuna Expressway, Noida-Gr. Param Homes is here with exciting home offers for buyers looking to invest in residential and commercial property in Delhi NCR. This is a golden opportunity and just the right time to get your dream home. Monsoon Bonanza comes with 50+ attractive offers in NCR on properties by 7 most reputed developers of the region namely Ajnara, Samridhi, Gaurs, Gulshan Homz and Panchsheel in residential category whereas Bhutani and WTC Noida in commercial category. Buy 2 bhk and 3 bhk flats for sale in the prime location of Noida Extension. 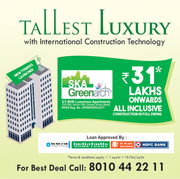 SKA Greenarch is developing project on the concept of green building in Greater Noida West. It has luxurious flats start from 92.90 sq.mtr on affordable rate. You can get location advantage by residing here like upcoming international airport and proposed metro station. Samridhi Luxuriya Avenue is the best residential project developing in Sec.-150, Noida. This project is loaded with lot of modern amenities and array of luxurious facilities. It has 2/3 Bhk apartments with wide range of area start from 1165 sq.ft. * For more information visit us www.samridhiluxuriya.info. If you are thinking some investment in commercial property on noida expressway with all facilities alphathum noida is a commercial project in sector 90 noida. Alphathum noida offers various sizes office space just only 12 lacs with assured return and 9 years lease guarantee. Alphathum noida one of the. Two Storey Prefabricated Houses New Prefabricated Modular Homes for Every Budget Our duplex prefabricated houses have the eye-catching design that reflects modern lines and offer comfort with their spacious interiors. Karmod prefabricated two storey modular houses come in wide range of plans and designs that suit different customers’ tastes and lifestyles. If you are looking Furnished & Spacious Apartment in Noida Extension (Greater Noida (West), Sector-1) at lowest price. Then please make sure you talk to us on our Toll free number 18001202006 & 9811736142. 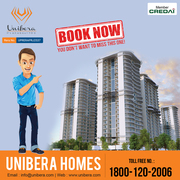 You can call us anytime or email us on info@unibera.com to discuss about "UNIBERA HOMES" in Noida Extension. It’s not easy to find residential property in Noida within your budget our realty world team helps you to find your dream home on Noida expressway with all lifestyle facilities within your budget. We have 7 years experience in real estate sector in residential property in Noida and commercial property in Noida with all facilities like transport facilities, metro station and Delhi NCR connectivity. Emaar MGF emerald estate launched 2 & 3 BHK flats in Gurugram with world class specification & floor plans. You can get benefits of buying 2 & 3 BHK flats With access to world-class amenities and cohesive urban designs around Golf Course Extension Road offering great connectivity to the city. Enquire now for getting more information about emerald estate. Approach Emaar India to find 3 BHK flats in Gurgaon that we are building in our project which we have started with the name Imperial Gardens where you will enjoy the nature at its fullest as it is enclosed by the gardens that are theme-based. What’s more? Just look at our website for getting the detailed project overview with the help of which you will know that what these flats consists. Raise your living standard by enjoying all the modern amenities in our 2 BHK apartments and luxury penthouses in Gurgaon which you will find in our different residential projects like Emerald Hills, Marbella, The Enclave, Palm Terraces Select and many more from Emaar India. If you are wishing to acquire full details, then you can either place your call to us or you can find out at our website. 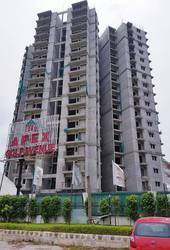 Real estate residential Project Apex Golf Avenue is the Vastu friendly and most ventilated Complex of Multi-storey apartments. That offers 2, 3 and 4 BHK luxury apartments is wonderful choice for the individual those who necessary to get spacious residential apartments only by spending affordable price. Godrej Nest Noida will a type of project that will be reasonable by end users who are looking for a 2/3/4 BHK apartments on Noida expressway with all ultra modern facilities. Which has all the modern amenities and good lifestyle? Godrej Nest Noida Project is intended to offer you plenty of facilities so that your home will certainly let you feel closer to nature. India ads for Houses for sale, Delhi, Houses for sale free ads Delhi, Houses for sale for sale Delhi, Houses for sale to buy in Delhi. This page is a classified ads listing for Houses for sale Delhi. This listing includes classifieds for sale and to buy in Delhi. If you posted an advertisement on Houses for sale, Delhi before please use Edit my ads button to change or cancel your ad. Houses for sale Delhi ads Delhi, Houses for sale classifieds Delhi, Houses for sale free ads Delhi, ads for sale Delhi, ads to buy Delhi, FREEADS in India. Find here ads for sale, to buy and rent in Delhi. Goods for sale in Delhi, vehicles for sale in Delhi, Delhi real estate for sale, Delhi property for sale, property for rent in Delhi, business ads in Delhi, Delhi business classifieds, services in Delhi, Delhi services ads, jobs in Delhi, pets for sale in Delhi, Delhi dating, Delhi cars for sale.